Your holiday home 365 days a year! Bradley’s Lake is approximately 120 acres in size and is home to the internationally known South Cerney Sailing Club where purchasers on this lake are offered membership to the sailing club. This is one of the most sought after developments in the area and there is always demand to purchase here. The Peninsula is an area of land projecting into the lake almost similar to an island and on here will be built just 6 of the most exclusive properties in the Cotswold Lakes. A plot of land and lodge on The Peninsula will always be the most sought after address and the jewel in the crown of the Cotswold Lakes. If you are searching for a property for sale in the Cotswolds, you have found the most idyllic location. This outstanding development has a unique position and includes some of the largest properties within the Watermark portfolio. 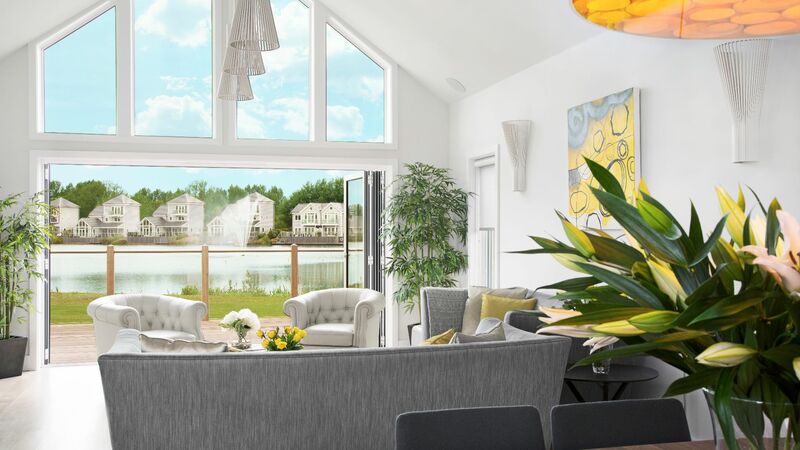 This exclusive development of 6 plots stands on its own exclusive peninsula of land, one of the largest fishing and sailing lakes in the Cotswolds with just one exclusive plot remaining. The Haven style lodge has five bedrooms, stunning views across the lake and a jetty with private lake frontage, large deck areas and a private garden. Purchasers of the Peninsula plots are offered a unique opportunity to purchase self-build plots of land. Watermark have their own team of award-winning builders (‘New England Construction’) to manage and build your bespoke property. Stamp duty is therefore only applicable on the purchase of the plot. Price on application. *Available on a 999 year leasehold tenure 365 days a year as a holiday home. Prices and availability are subject to change, please contact us for the latest price list and information. Another spectacular five bedroom detached New England style lakeside property with an open plan living area with vaulted ceiling and ground floor en-suite bedroom. Enjoy the generous deck area right on the water’s edge. Finish the home to your own taste and specification. Add a touch of luxury to this stunning holiday home and relax in these peaceful spacious grounds with private security gate and a full-time management team.